Hamilton Harbour is one of 43 locations around the Great Lakes where environmental degradation has led to the decline of ecosystem health locally and to the Great Lakes Basin more widely. 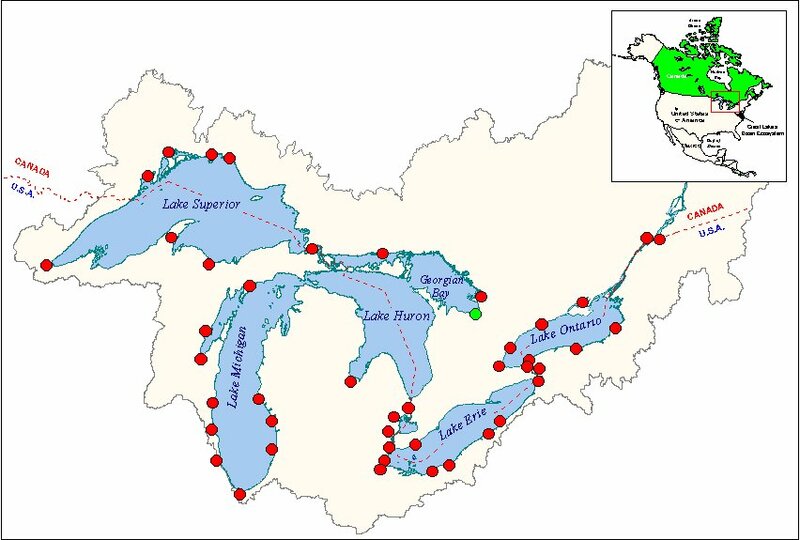 The locations along the Great Lakes, referred to as Areas of Concern (AOCs), are located in Canada (12), the United States (26), and some are even shared between the two nations (5). The interconnectedness of the Great Lakes system and links to other waterways, such as the St. Lawrence River, requires cooperation between the countries that share these waterways. Under the Great Lakes Water Quality Agreement (GLWQA) of 1987, AOCs in Canada and the United States were formally identified. To remediate the damage in each AOC, government, community, and industry partners are undertaking Remedial Action Plans to restore environmental health in their local areas. What Makes an Area of Concern? In Ontario, the responsibilities for RAP progress and Area of Concern remediation are shared by the federal and provincial governments through the Canada-Ontario Agreement Respecting the Great Lakes Basin Ecosystem, also known as COA. COA sets out specific results and detailed commitments that support local RAPs, ultimately leading to remediation and protection of the 15 remaining AOCs in Canada. The oversight and hands-on implementation of a RAP includes a variety of departments at all levels of government, non-governmental organizations, academia, business and industry, and the public. A local RAP team tracks environmental conditions, activities, and outcomes relevant to the RAP. For more than 100 years Hamilton has been exposed to industrial and urban development. In the middle of the nineteenth century, the Great Western Railway was founded in the city, making Hamilton the centre of Canadian industry. Hamilton's industrial past has come at a price, namely, environmental degradation of surrounding ecosystems, in particular Hamilton Harbour. Prior to modern pollution laws, waste was dumped into the Harbour by industries, which today, continue to threaten public health, contaminate fish and wildlife, and restrict the use of the waterfront. Over the past century, sediment contaminated by metals, polychlorinated biphenyls (PCBs), and other hazardous chemicals has been released into the environment. Damage done to Hamilton Harbour through industrial development and population growth has resulted in the area's designation as an “Area of Concern” (AOC). As a source for social, economic, and ecological progress, significant work has been done to remediate the Harbour and delist it as an AOC using a Remedial Action Plan (RAP). The work required to correct the problems identified in Hamilton Harbour in the early 1970’s had proceeded to the point in 1985 where the Ontario Ministry of the Environment reported that many of the water quality problems associated with industrial discharges had been resolved and sewage treatment had been substantially upgraded. Yet, problems remained and potential management options to address remaining discharge and contaminated sediment problems were outlined. A Stakeholder Group worked with the RAP Technical Team to develop the Stage 1 and Stage 2 Reports. With the submission of the Stage 2 report to governments, the institutional structure recommended in the Plan was implemented with the formation of the Bay Area Restoration Council (BARC) and Bay Area Implementation Team (BAIT). The BAIT is mandated to implement the remedial actions while BARC is mandated to monitor and promote RAP progress and report on actions and inaction. In 1998, a Stakeholder Group called the RAP Forum was organized to review and update the Stage 2 Report for Hamilton Harbour. The RAP Forum completed the update and approved a Stage 2 Update in December 2002. This update was released to the public in September 2003. It is used as the basis of the “Implementation Actions” work plans. The RAP Forum reconvened in 2012 to update the delisting objectives and reconfirm the status of all the beneficial uses. In 2013, BAIT prepared a new work plan to cover 2012-2016 actions in more detail. For full information on the development of the Hamilton Harbour Remediation Plan and its governance click here. A great strength of the Hamilton Harbour RAP is the significant public involvement and support for the RAP. This is a direct result of the active role of the BARC and is often identified by other Great Lake RAPs as one of Hamilton Harbour’s greatest attributes. Public consultation serves to inform and stimulate interest in local water quality issues and provides a basis for generating broad community support for RAP implementation. Input is obtained from the local organized public advisory councils (municipalities, industries, universities, interest groups, and general public) to better define use goals affected by water quality and remedial options for restoring these goals in each Area of Concern. Since the implementation of the RAP in 1992, the Harbour has experienced many successes. Here are just a few of the latest achievements.